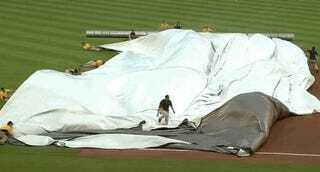 As the Pirates’ grounds crew struggled to spread the tarp on the field in inclement weather Tuesday night, one man was nearly consumed by the polyethylene menace before Andrew McCutchen and Sean Rodriguez came to help. 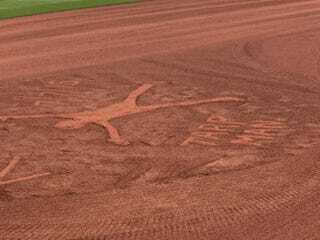 Before today’s game, someone created a respectful memorial for Tarp Man. He died doing what he loved: putting a tarp on a field.